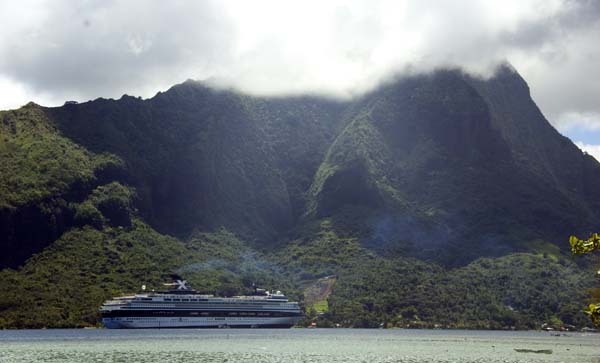 I have been lucky enough to explore many islands throughout French Polynesia, on 3 different ships since 2006. The political entity of French Polynesia is made up of five main island groups. The largest is the Tuamotu Islands. It includes over 70 atolls spreading diagonally across the Pacific Ocean for some 1500 kilometres. The other island groups are the Marquesas, the Australs and Gambier archipelago. But most of the population lives in the Society islands. This is famous for its largest island Tahiti, where the capital of Papeete is located. It is also famous for its beautiful steep rainforest islands, such as Bora Bora. Many (in fact, most) of the islands are hard to get to. And note that there is not a huge diversity of terrestrial wildife, but there are some important endemics. It also suprises many people that the diversity underwater is also lower compared to the south-west Pacific. Generally, the further east you go out from south-east Asia and New Guinea, the less biological diversity of marine, seashore and terrestrial species. However, there are also many great underwater sites, and the beauty and remoteness of these islandss is undeniable. The best way to experience the islands is probably on a ship, giving you access to remote areas, and allowing for great views. There are cruise ships that go out there regularly, some ships that are based out there, and every few years an expedition company gives it a go before pulling out again.